Newark, the third oldest city in the United States, offers many exciting things to see, and we will be fortunate enough to explore three private Victorian homes there. After a traditional Portuguese lunch in the city’s historic Ironbound section, we will visit the Ballantine House at The Newark Museum. 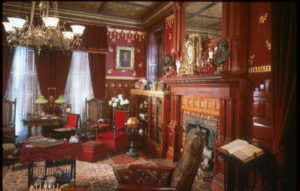 The 27-room, late Victorian-style mansion was built in 1885 for Jeannette and John Holme Ballantine of the celebrated Newark beer-brewing family. The original house had eight bedrooms and three bathrooms. A part of the museum since 1937, today two of its floors are interpreted as a suite called “House & Home” with eight period rooms, two hallways and six thematic galleries—all filled with things that might have been found in people’s homes from the 1650s to the present.